Fleet 5 is on Facebook! Go to Thunderbird Fleet 5 Boston - lots of great pics! “Tarris” #1113 has been adopted (you don’t buy a T-bird, you adopt it) by Charlie Barranco and Bob Foley of St. Michaels, MD. We splashed the boat last Friday. It only took us two engines to motor the 10 miles from Kent Island to St. Michaels. The rigging will be tuned Monday night and “Tarris” will sail her first race on Wednesday night. The plan is to bring “Tarris” to Boston next August. Fleet 5 South is now 3 boats strong!!!! I'm home OK, but with lot's of drama on the way. First I want to thank you for your hospitality and help yesterday! The sandwich was awesome. The trip started with the first tie-down strap coming loose on Rt. 25A (a few miles from your house). It happened again about 10 miles down the LIE. The real drama started when I miss read the exit number for the Clearview Expressway. There was an accident on the LIE at exit 29. While I was sitting in traffic, I glanced down at the road map to verify my exit number and read "Exit 21". As I was negotiating the traffic, I cruised by exit 27 and saw the signs for the Clearview and Throgsneck Bridge. No way to reverse direction so I resolved to go back the way I came... down through the Brooklyn Queens Expressway (IS278). Fortunately the traffic was only moving about 5 mph... That road hasn't seen maintenance in the last 30 years. But watching the boat and trailer bounce up and down every few yards wasn't the real problem. About halfway to Staten Island I'm looking in the rearview mirror and realize that the left front jack-stand has come loose and is hanging down like a limp willy. Now there's only three jack-stands keeping the boat from tipping over. As you know that's an elevated highway and there are no turnoffs for emergencies. I limped along as slow as I could alternating sweating and peeing my pants on every bump. At the top of the Verrazano Bridge I'm seeing this image of my boat tipping over and either taking 4 or 5 cars with it, or going over the side into the river. I was seeing my picture on the front cover of The Daily News... "Thunderbird falls off bridge and comes up floating." I figured this must be some reality show where I can call a friend when I get stuck. I tried to call my friend Lad in Maryland, but my hands were shaking so I couldn't dial the number. I was finally able to pull over to the side on Staten Island (although still feeling the cars brush by my pants) and look at what was going on. Fortunately when the Pad on the jack-stand flipped down, the boat landed on top of the pad edge which kept it from unscrewing any further. But now I had another worry... I was worried that the next bump would cause the pad to puncture the bottom of the boat hull. Nothing I could do about it but keep on until I reached a safe area to stop. The Goethals Bridge was the next challenge. For some reason they believe that 7' - 6" traffic lanes side-by-side constitute ample travel space. I had about 2" of space to spare between the concrete barriers and the traffic passing me at double my speed on the other side. I was finally able to stop at a service area 6 miles down the New Jersey Turnpike. The large lock nuts that were suppose to keep the jack screw from turning were vibrating loose. I was able to carefully back the offending one down a bit further in front, flip the pad up, and then raise the pad about 6" back into position without dumping the boat in the parking lot. Two others were starting to loosen in the rear as well. I retightened everything and continued on down the NJ Turnpike. One mile before the Delaware Bridge crossing the same thing happened again. Stop, get out the pipe wrench, re-tightened and continue on home. I left your house at 2:30PM, and arrived home at 9:30PM. Went directly to bed!!! "Taaris" is resting as well. Bob Larsen reports that he recently had a visit from Thunderbird icons Vidas Stukas and John Booth. "We had a great time (my wife said it was like having 3 little kids around). John is a very funny guy…. Great stories. Numerous bottles of wine consumed and we managed 6 hours of T-Bird practice in shirtsleeves on Wednesday. Got a great sailing lesson on how the Canadians make a T-Bird sail fast downwind. At the end of the visit, they were talking about staying for the summer," said Bob. There is also a report that Bob has agreed to purchase Taaris from Vince Juliano and plans to bring it to Maryland to try & build a T-Bird Fleet. Part of the plan is to have #1113 compete at the Internationals in 2014. The "other" Maryland T-Bird, Mike Gorman's Allcut, is switching out it's wooden mast for the aluminum mast he obtained from Boston. Congratulations to Geoff Youngman & the crew of Atomic Salsa for capturing the Mass. Bay Sailing Assn. season championship for Fleet 5. Salsa edged Ken McLeod's Flying Gull by a mere quarter of a point. Mysterious Ways placed third. Youngman's team won both the Hull One Design Regatta and Quincy Bay Race Week during 2012. Atomic Salsa was also third at the Lipton Cup and fifth in the Spirit Series. Tank rolled over the competition to win a fiercely contested Spirit Series Aug. 11 &12. Four of the six boats won races in the five-race series. Tank was the only boat to win two and finished with a low-point total of 11.5. Flying Gull placed second with 13.75 points. Skipper Ken McLeod surely would like to have one mark rounding to "do over." Leading race 3 at the leeward mark, Flying Gull's keel snagged the mark. When all was said & done the Gull had dropped to the back of the pack and out of the series lead. Langouste eeked out a tiebreaker over Mysterious Ways to claim third place. Atomic Salsa & Thunderation followed. SHYC's Race Committee (Brian Pitt, Bill Kane, Katrina Pitt, Fred Braunies & Reed Cournoyer) did an excellent job running the series in Quincy Bay and got all five races in despite the threat of severe weather on both days. Mysterious Ways & Tank finished 2-3 in PHRF Class D at the Bowditch Race at Palmer's Cove YC in Salem. Lots of pics at the Bowditch Race page on Facebook!! Geoff Youngman skippered AS to victory on both Saturday & Sunday to clinch the series hosted by Squantum YC. Atomic Salsa won two of three races to capture the Don Kavanagh - Thunderbird Class Trophy at the Hull One Design Regatta July 14 & 15. Due to light air only three of the scheduled races were run. Flying Gull placed second with Thunderation third. “Allcutt” #1247 sailed for the first time in about 7 or 8 years last night. Mike sailed out of the harbor to the starting area (first time he’s had the boat sailing). At the 1 minute to go point, they were still trying to find a place to tie the tack of the jib to the stem (grin). They did make the start a few seconds late. They also haven’t rigged any spinnaker hardware yet so he finished at the back of the pack, but had a great time anyway. *BlewBird took first place - and lead their division by four points. A happy event for the Fleet 5 Mission Fleet in St. Michaels, MD. “Rag Bag” (the T-Bird we rescued from the bankrupt marina in East Providence last Fall) was re-christened “AllCott” and launched for the 2012 racing season today. Pix’s attached. The keel, bottom, and hull have been restored. The topsides will be worked on between races in the water. Mike Gorman (the proud owner) is a shipwright in charge of maintaining the wooden boat fleet at the Chesapeake Bay Maritime Museum in St. Michaels. Mike’s comment after the boat was floating… “This is the first damm wooden boat I’ve ever launched that didn’t leak when it splashed. This is a whole new dimension.” You can reach Mike at gormanshipwrights@live.com. Just a week after delivering Langouste to Savin Hill from Toronto, Sean Kane was forced to haul Chikanery after hitting a rock during the Hingham Bay PHRF Solstice Race. Sean purchased the boat from Barry Smith of Toronto and planned on fixing it up for racing in the 2013 season. But plans changed when Chikanery was severely damaged during it's first race of the 2012 season. Sean was seen working on Langouste the very next day and will be launching her as soon as possible. 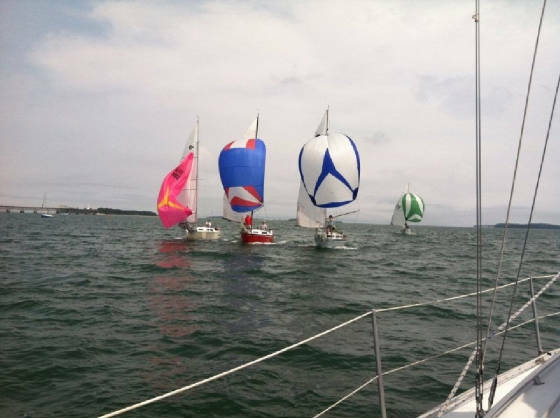 During the recent Fleet 5 meeting it was decided to retire the Fleet 5 trophy and have just one season-long competition. The Mass Bay Trophy will be the trophy for the season championship. 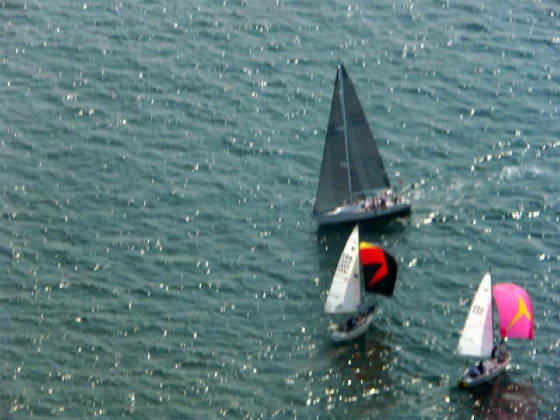 Twilight Racing will start at 6:30 p.m. Spinnakers (small verison) may be used during the June 22, June 28, June 29 and August 9 Twilights. No kites may be hoisted after sunset. The possibility of hosting the 2014 Internationals was discussed. It was agreed to meet again later this year for further discussion. The Fleet voted to name the new Hull One-Design Regatta Thunderbird Trophy after Don Kavanagh. A possible cruise was discussed for the first week of August.